Justice P. I Ajoku of the Federal High Court, sitting in Benin City, Edo State, today Wednesday June 13 , 2018 convicted Uke Philip Akhator for offences bordering on obtaining by fraudulent trick. .
Akhator who was prosecuted by the Benin Office of the EFCC, was said to have obtained the sum of N150,000 from one Jakub Sani Mohammed by fraudulent tricks. Upon his arraignment on a one count charge, Akhator pleaded guilty to the offence. In view of his plea, the prosecution counsel, Larry Aso Peters, urged the court to convict and sentence the defendant accordingly. In his response, defence counsel, Padro Egharevba pleaded with the court to tamper justice with mercies as the defendant was a first time offender who has become remorseful since he was arrested and has also promised to desist from such despicable act. 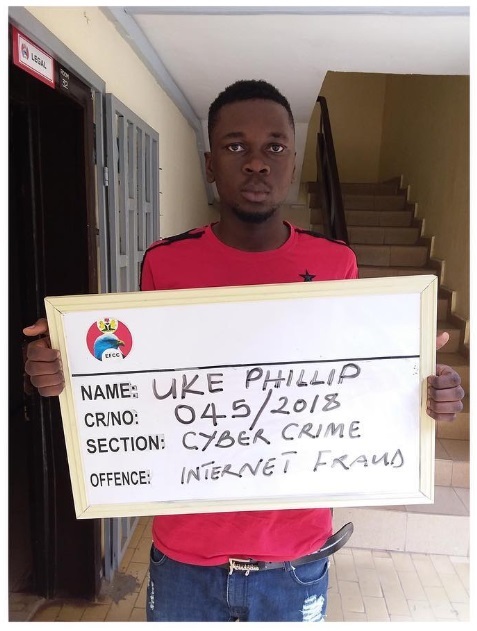 0 Response to "Yahoo Yahoo Boy Jailed Over N150k Fraud In Edo State Nigeria"